Thoran means a vegetable side dish (veg bhaji/sabzi) served with rice. 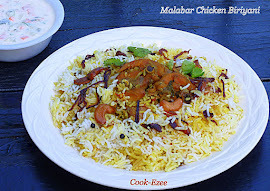 In Kerala we make thoran's with variety of vegetables and it is a mandatory dish served daily with rice or chappathi. 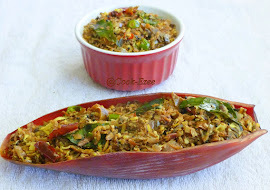 Cabbage thoran is Keralites favorite and this dish is lucky enough to get a special place in even Kerala Sadya dishes. I have started using the Violet cabbage instead of white one after coming to US sinve it is rich in Iron and vitamins and also is easily available in market. Cooked violet cabbage looks awesome and tastes great :). So here comes the authentic Kerala recipe of cabbage thoran, you can use white or green cabbage which ever you have handy at home. Serve with rice and Moru/yogurt curry!!! 1) Mix chopped cabbage with onion, green chilly, turmeric powder, salt, few curry leaves and grated coconut and set aside (mix these entire things well with hand). 2) Heat up a frying pan, pour coconut oil, add mustard seeds and let it crackle. Add urad dhal, remaining curry leaves, red chilly and sauté for a minute. 3) Add the cabbage mix to this and stir well. Close the pan with the lid and let it cook for another 2-3 mins. 4) Open the lid, stir well and check for the taste. Switch off the flame if the cabbage is cooked enough. You really don’t have to cook this for long, the crispy cabbage tastes better. 5) Cabbage Thoran is ready to serve with Rice/Roti. My alltime favourite. Luv this.